IMPD: Don't warm up your car with the keys inside! It's a warning we hear every year, "Don't warm up your cars unattended with your keys inside." But it keeps happening over and over across Indianapolis and more cars are being stolen every day. INDIANAPOLIS — It's a warning we hear every year, "Don't warm up your cars unattended with your keys inside." But it keeps happening over and over across Indianapolis and more cars are being stolen every day. Since December 1st, 2018, nearly 1,000 cars have been stolen in Indianapolis. Many of them were crimes of opportunity, because vehicles were left unattended running with their keys in the ignition, according to the Indianapolis Metropolitan Police Department. On one of the coldest days of the year, Call 6's Paris Lewbel and IMPD Officer Aaron Hamer headed out on the streets to see how bad it is really is. It wasn't long before we found the first car running with the keys inside and then in just two blocks, we found our second, third, fourth and fifth cars. "It's very easy for the person to get in this car get in it and take off," Hamer said. "You can see the taillights on and you see the smoke obviously indicating that the car is on. I think this just shows another level of recklessness." We headed over to Broad Ripple and it was the same thing, one car after another. At one house in Broad Ripple, we found both cars running in the driveway and the car running in the next door neighbor's drive as well. We started clock and waited outside in the unmarked police SUV. We could see the family getting ready inside through the home's big bay windows. But we waited for more than four minutes, before she noticed we were outside. As she came out to approach the SUV, Hamer turned on the SUV's blue and red lights and introduced himself. Hamer told the woman about the concerns of leaving vehicles unattended while warming up and the increased number of stolen vehicles citywide. She said, "I know. We're getting ready to pull out." We pulled off and parked down the block and watched as the woman went back inside, leaving both vehicles running in the driveway. "She said she was going back in for a minute and we've been here for a minute now and so in the time we've had the interaction with her, someone could jump in the car and take off again," Hamer said. It doesn't just happen on the north side, it's all over the city. On the city's east and west side, it was the same thing, car after car running with their keys inside as well. "It's shocking," Hamer said after we saw so many cars running in driveways. IMPD says it is simply not worth it and insurance often doesn't cover the car if it is stolen with its keys inside. 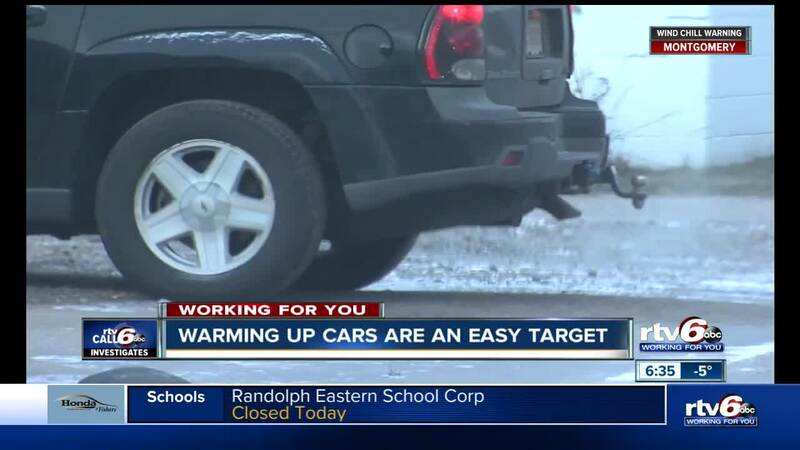 IMPD suggests investigating in a remote starter that can run anywhere from about $100 to several hundreds depending on the features, but if someone breaks into your vehicle, remote starters don't allow them to shift into gear and your car is safe.